Do you know what an event planner’s worst nightmare looks like? A completely set up conference center with a scarce crowd in attendance. What if you spent months planning a corporate event and no one showed up? It happens. And typically because the corporate event planner forgot to use compelling engagement tactics during the pre-event stage. Without this critical element, stakeholders may not be motivated enough to attend. This may be a worst case scenario, but that doesn’t mean you can sleep on pre-event engagement. Here are some ways to ensure your event has the best chance at being a success. Everything that goes into pre-event engagement is so important, but everyone needs a starting point. An ideal starting point will be to formulate a registration system as soon as possible. Through email registration, a mobile event app or on your intranet, have a place where your employees can sign up for various sessions and events. This will get the ball rolling for various marketing opportunities in the months to come. With registration info in hand, it becomes much easier to segment your marketing techniques. According to Mailchimp: Email opens are 14.14% higher, and unique opens are 10.22% higher than non-segmented campaigns. Take this opportunity to suggest other sessions for your stakeholders to attend, based on what they’ve already signed up for. Or you can request they join certain forums to discuss topics they are interested in. When it comes to using this information, the possibilities are almost endless. People love teaser content. Whether it’s movie teasers or clothing line teasers, anything we can get a preview of early is music to our ears. That is why releasing information leading up to the event can really get people excited. The countdown tactic is a very interactive way to go about releasing teaser information. It reminds people the day is getting closer while showing them what’s to come. So, how do you set up teaser content? What’s unique for your brand? You can form a series of blog posts or podcasts to give a more personal feel to the conference. Once it gets closer to the big day, you can start to release videos to visually show them what’s waiting for them to bring excitement to a fever pitch. As far as teaser videos go, check out this incredible clip created for CPG client, Butler Manufacturing. This was used to promote their most recent Builder Meeting. All of this content can be placed on the several different platforms, such as social media sites, the intranet, or the mobile event app. Wherever you put the content, just make sure it’s both fun and informative. When it comes to crafting the perfect event, attendee input should play a large role. One size doesn’t fit all when it comes to events, so make sure you listen to the voices of your people. Catering to the needs of your stakeholders makes it easy to turn attendees into active participants. An excellent way to do this is through open forums asking what they want to learn, or what they liked/disliked about previous conferences. To execute this plan, an email campaign can be put in place where you simply create an online survey for them to take. Then you get instant results. Another tactic would be to open a discussion form or survey on the intranet. Ask questions like, what topics they want to discuss, or what fun activities they want for downtime. CPG client, Kohl’s Department Stores, recently dove into this engagement strategy for their “One Team” conference last year. After listening to what people wanted, they created their own event app for the first time ever. Now instead of packets of papers for attendees to keep track of, they could find everything they needed in once central location. Their statistics showed a 97.4% usage and engagement rate for the app. It’s a fact that people love seeing content created by themselves and their peers. This is why social media apps, like Snapchat, are so popular at events. We thrive on watching what others do and love to see our name on a screen. When it comes to engagement before an event, this need to know the experiences of people around us can be used to your advantage. User generated content is a great, free way to market your event, which makes it a vital piece of the puzzle. CPG has seen the benefits of this tactic in action while working on Ulta Beauty’s annual conference in 2016. Prior to the event, a website was created where all the employees could submit a video of their Karaoke skills. Their co-workers were encouraged to vote on the best ones to determine several finalists. The finalists then performed against each other at the conference in American Idol style, to fun (and funny) results. Ulta Beauty saw a lot of success from this competition. The pre-event activity was able to really jumpstart and enhance engagement during the conference. It was a great way to showcase how a work conference is more than just sessions and networking opportunities. Once all the other pieces are in place, it’s important to remember one last thing. Social media should be your best friend during the pre-event stage. It can often be the most convenient way to reach the future attendees. This is also a space they feel comfortable being themselves, so it could help generate honest feedback. With that being said, I have three words for you: Hashtags, Hashtags, Hashtags! This is a great way to measure social media engagement for the event. Some might think hashtags are only useful during the actual event, but that is far from the truth. The earlier the better. According to Eventility.com, 123,995 users contributed to 280,443 tweets in the 5 days prior to SXSW 2013. Along with creating the hashtag, don’t be afraid to throw in some fun memes and gifs with event-related content. This is a creative way to show your organization’s personality and culture. Don’t let your people go into a conference blind – that’s not the experience they’re looking for. A well thought out communication strategy that excites attendees long before they walk through the doors is the key to a fully engaged audience. Start off with a bang to generate buzz, and keep the energy up as your event grows closer through a strategic cadence of touchpoints. Inspiration shouldn’t fade after the show ends, either. 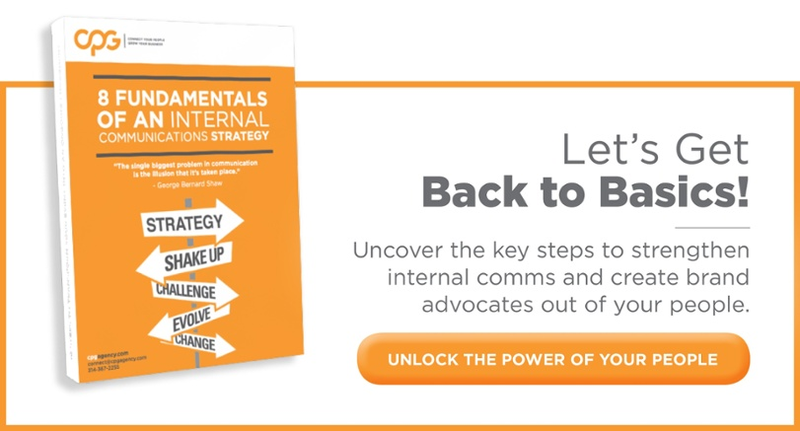 See our other resources for more tips on how an internal communications strategy engages employees at every stage of their journey.